President Barack Obama’s policy on Iraq is a complete failure. As terrorists from the so-called Islamic State lay siege to Kobani, defeat once-solid Kurdish forces and threaten western Baghdad, the folly of Obama’s campaign, limited to air strikes for purely political reasons, is clear to the world. And Obama’s former advisers agree that his hasty, total withdrawal from Iraq in 2011 and inaction on Syria are the main reasons for the deadly chaos. The latest to point the finger of blame at Obama is none other than former Secretary of Defense Leon Panetta, a Clinton acolyte. But Hillary Clinton can hardly escape blame. Though she now claims that, as Secretary of State, she urged Obama to intervene in Syria, the fact is that she never took the matter seriously enough to make her opposition known to the public, nor did she offer to resign her office as an honorable expression of difference. 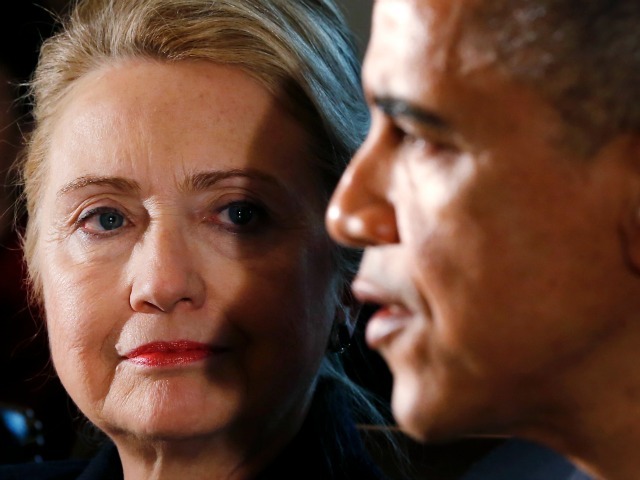 In fact, on the most important point–rapid withdrawal from Iraq, regardless of the consequences–Clinton, who voted to authorize the Iraq War in 2002, had come around to Obama’s view by 2006. She proposed beginning a rapid withdrawal of U.S. troops from Iraq within 90 days, before the “surge” advocated by George W. Bush had the chance to secure victory. By 2007, she co-sponsored a withdrawal deadline–atoning for her pro-war vote. At that stage, it was eminently clear what rapid U.S. withdrawal would mean: American defeat, the rise of terror armies, and likely genocide as rival Iraqi factions slaughtered one another. Bush warned that such a withdrawal meant “increasing the probability that American troops would have to return at some later date to confront an enemy that is even more dangerous,” a prediction that has come true despite Obama’s efforts to avoid reality. For his part, Obama said on the campaign trail that he would not delay a withdrawal from Iraq, even if doing so meant genocide. He has now launched airstrikes against ISIS–which he insists, again for political reasons, on calling “ISIL”–to prevent genocide. But his reluctance to commit ground troops to that effort, as darkness falls on Yazidi, Kurdish, and Christian communities, shows that he has not actually changed his core policy on Iraq. That policy is not to achieve any concrete objective, but to prove that Bush was wrong, and that the war was “dumb.” Because the “surge” was also “dumb,” and the solution to Bush’s “dumb” war, in Obama’s–and Clinton’s–view, was the rapid withdrawal of troops, re-introducting troops would amount to a tacit admission that Bush had actually been right about something, or that Obama and Clinton had themselves been wrong. Obama administration officials are now bending over backwards to claim that the loss of Kobani–which would mean a tremendous victory for ISIS, a crushing defeat for the Kurds, and the end of one more refugee escape route to Turkey–would not actually be significant. The key, they say, is to hurt ISIL in its core territory, in Syria. Yet that fight is hardly going any better, amidst the thicket of rival armies deadlocked in that country’s civil war. The sad fact–acknowledged, now, even by anti-American Iraqi factions–is that only the arrival of U.S. ground forces can save Iraq from collapse and prevent ISIS from becoming a virtual, genocidal republic of terror. U.S. policy–urged on by so-called “realists”–is an absolute disgrace, with John Kerry wasting time on Gaza while Obama raises cash in Hollywood. It is a disgrace that Clinton must share, despite her cronies’ pre-2016 spin.